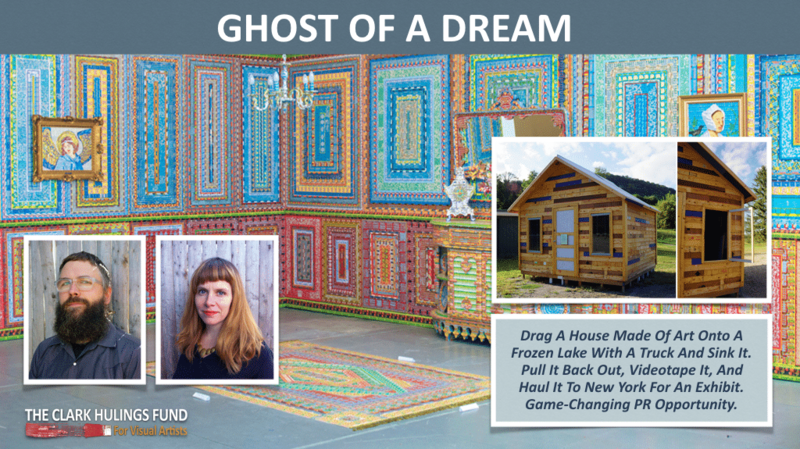 Ghost of a Dream is a collaboration between Adam Eckstrom and Lauren Was, who met while pursuing master’s degrees in painting and sculpture, respectively. The fund is supporting their “Fair Housing Project,” which is slated for exhibition at Smack Mellon in Brooklyn, New York (September – October 2016). For this piece about art fairs and the volatility of the art world, the duo plan to create a house entirely from ephemera discarded at major fairs, and set it out on a frozen lake in February. During the spring thaw, the house will be allowed to sink into the lake, from where it will be retrieved, as the entire process is captured on film. For more information on their collaboration, check out VICE’s video on Ghost of a Dream’s collaboration.